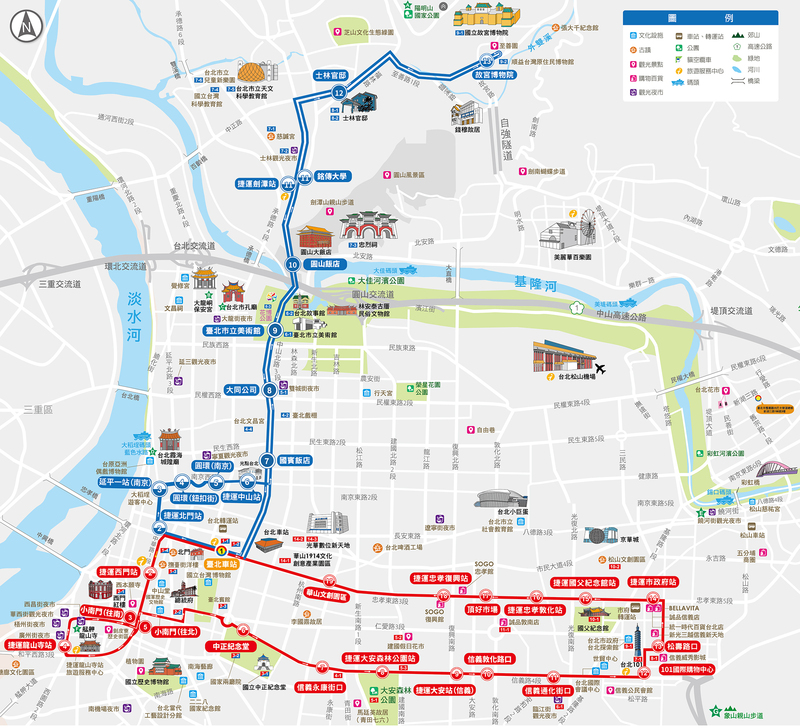 The newest addition to Taipei City's efficient transportation system, the double decker 'Hop-On, Hop-Off' bus gives visitors a hassle-free way to tour the city by usage of a day pass for both the Red and Blue lines. 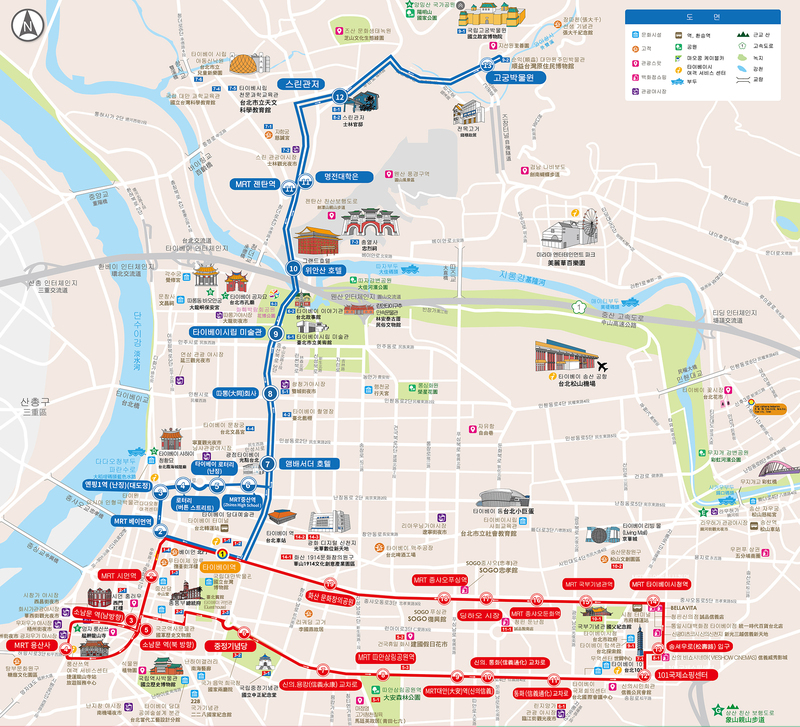 The sightseeing bus runs along two routes, both leaving and ending at Taipei Main Station, Exit M4. On average, each journey from start to finish takes 100 minutes, however during rush hour may take up to 130 minutes. Bus intervals are approximately 30-40 minutes, and the time schedule for each line can be found lower on this page. Services provided on the bus include unlimited Wi-Fi internet and a tour guide headset in English, Chinese (華語), Japanese (日本語), and Korean (한국어). After leaving Taipei Main, both lines run west, looping around the city's North Gate heading through Ximending and past the Presidential Office Building toward Chiang Kai-shek Memorial Hall. After here, the lines split. The Red Line continues east on Xinyi Road past foodie haven Yongkang Street toward Taipei 101. After looping the Xinyi Shopping District, the bus heads back east along Zhongxiao East Road, stopping at Taipei City Hall, Sun Yat-sen Memorial Hall, twice in Dongqu (東區), and once more nearby the Huashan 1914 Creative Park and Guanghua Digital Plaza electronics market, ending up back at Taipei Main. 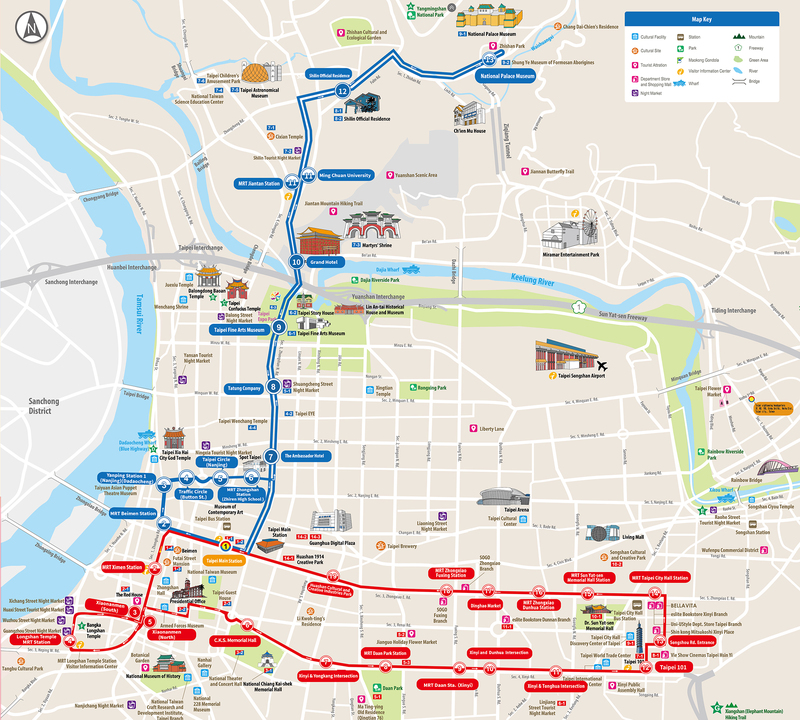 The Blue Line continues by heading north along Zhongshan North Road, stopping at the Taipei Fine Arts Museum which is within walking distance of the Dalongdong Cultural and Historical District and Taipei Expo Park. 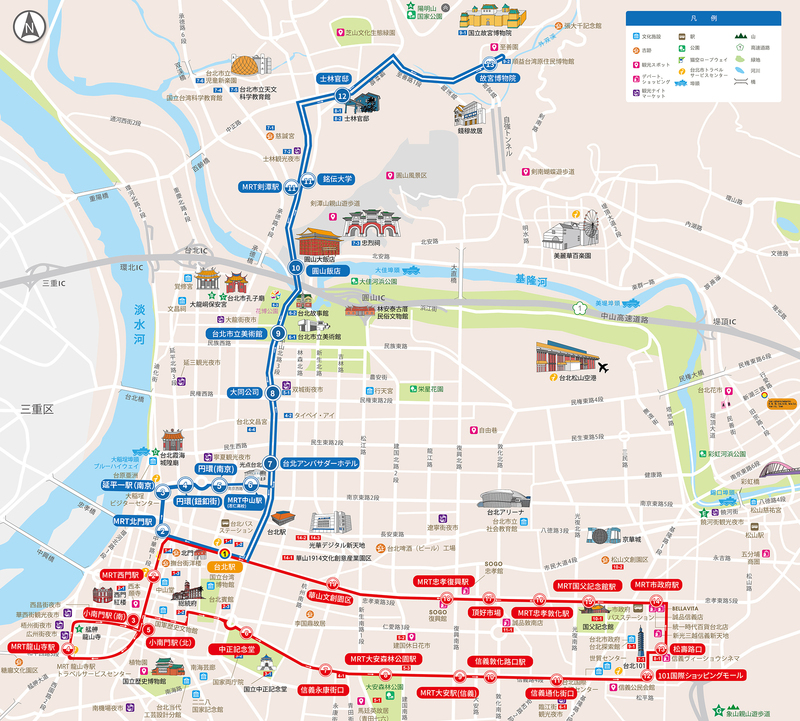 After crossing the river, the bus makes stops at several locations in Shilin District including the Martyrs' Shrine (忠烈祠), Taipei's largest night market - Shilin Night Market, a children's amusement park and science museum, and Chiang Kai-shek's former residence. The blue line terminates at National Palace Museum (故宮), after which it switches direction back to Taipei Main Station. Tickets are available for reservation online, and visitors are recommended to get a day pass which allows unlimited 'Hop-On, Hop-Off' rides on both lines. Tickets reserved online with our partner are 10% cheaper.